You can use the Sync feature to share your PC settings among Windows 10 devices so you don’t have to redo the settings on each device. To sync, the Sync feature has to be turned on in settings, which it is by default. If, for some reason, it’s been turned off, you have to turn it on. To turn on the Sync feature, start by pressing Win+I to display the Settings window. Click Accounts, and then click Sync Your Settings. Click the Sync Settings On/Off button if it is turned off to turn it on. Click the window Close (X) button to close it and apply the settings. With the Sync feature turned on, sign in to your Microsoft account on another device, and all your settings will be synced from the cloud. Syncing works only with Windows 10 settings and settings for apps that you buy from the Windows Store. When you turn on syncing, you can choose what you want to share. For example, you can share language preferences, passwords, or Ease of Access settings. To set up what you want to sync, begin by pressing Win+I. In the Individual Sync Settings section, click the On/Off buttons for the various settings you want to share, such as web Browser Settings or Apps settings. 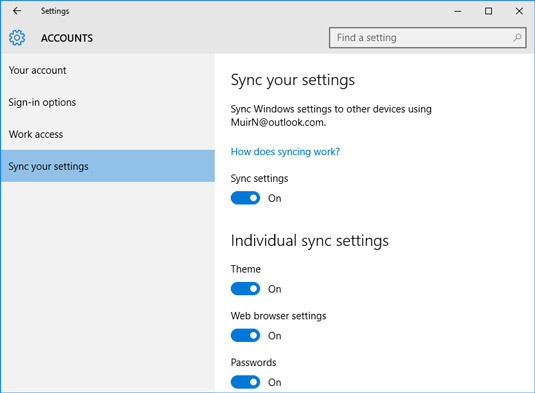 With Sync turned on selected settings are synced automatically among Windows 10 devices. Click the Close (X) button to close the window and apply the settings. If you’re charged for data or Internet connection time — for example on a Windows 10 tablet with 4G — you can avoid charges by changing settings. Go to Devices in Settings and click the On/Off button under Download over Metered Connections.